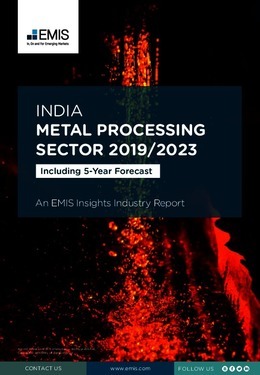 The Indian metal processing sector enjoys solid foundations for growth, stemming from the industrialised economy and the abundant metallic mineral resources. Still, the sector accounts for less than 2% of the economy in terms of GVA at current prices and claims a share of about 10% in the manufacturing industry. India is a net non-ferrous metals importing country running an annualised deficit of INR 1.8tn, according to the latest official data for FY2018. This is largely due to the negative foreign trade gap on the gold account as India is the second-largest gold market in the world. In addition, the country ranked fourth both in terms of aluminium smelter production and production of refined lead. This report provides a complete and detailed analysis of the metal processing sector for India. EMIS Insights presents in-depth business intelligence in a standard format across countries and regions, providing a balanced mix between analysis and data. Build a clear picture of production, consumption and prices for specific sub-sectors (e.g. iron and steel, non-ferrous metals).